Steel tube (and Steel Pipe) has evolved over history. Specifically, metal tube has been around since around 3000 BC. In fact, Egyptians made the first metal pipe from copper. As early as 2500 BC, Chinese used bamboo pipe as a way to transport natural gas to light Peking, their capital. Rome and Persia created aqueducts to bring water to city centers for bathing, washing and drinking. Furthermore, pipe (or tubing) is made with many different materials and methods. Hollowed stone, fired clay, bamboo, palm, redwood, lead, bronze, copper, and rubber are just some of the materials that makeup tubing. In the mid-1800’s the modern steel industry was bolstered with the Bessemer process. The Bessemer process represented the first inexpensive method for mass production of steel pipe. Subsequently, seamless tube was born in 1895. Quickly followed by manufacturing of auto, bicycle, and machinery for oil production which began in full force. It was not long after, that efficiencies in manufacturing lowered prices and steel pipe and tubes became common. Presently, there are many different types of Steel Tube and Steel Pipe being manufactured. Depending on the application, J524 Seamless Hydraulic Tubing, J525 Welded Hydraulic Tube, and many other specialty steel tubing and piping are available. To better understand steel tubing, let’s explore the differences between steel tube and steel pipe. Most would think that both are the same. Though there are many distinctions between them, i.e. standards, measurements, uses, and applications. Firstly, there IS a difference between a steel tube and steel pipe. It’s NOT just about semantics. The basic distinction is their common uses, measurement, and terminology. Let’s take a look. Tube, generally speaking, is for smaller applications, i.e. hydraulics, fuel lines, etc. SIZE: And regardless of its material, steel tube is measured by its actual outside diameter (OD). For instance, the diameter of a 1 ¼” tube is a true 1.25″, while a 1 ¼” pipe is 1.625″. The wall thickness of thinner tubing is measured by gauge while thicker tubing is measured in fractions or millimeters. However, this is NOT true for a pipe. A pipe’s wall thickness is referred to as “Schedule” specified by ASME B36.10. NOTE: There is no set formula between a pipe’s Schedule and its wall thickness. One needs to refer to ASME B36.10 for relevant standards. MATERIAL: Often made from mild steel, aluminum, brass, copper, chrome, or stainless steel. JOINING/WELDING: Tubing is joined by brazing, flaring, or other mechanical means like couplings. MECHANICAL/CHEMICAL PROPERTIES: Steel tube chemical properties are very important for quality and process. Therefore, its microelements such as chemical composition are crucial. In addition, mechanical properties such as tensile, yield strength, and elongation are specified depending on its application. Pipe is generally used for larger applications, i.e. oil and gas transmission lines, refineries, and structural. SIZE: For instance, steel pipe diameter is indicated by its “Nominal” thickness and NOT actual thickness. In other words, “Nominal” or NPS is a non-dimensional number referring to the diameter of a pipe’s hole. Standard pipe schedules and sizes are specified differently than tubing. Piping is identified by its diameter with another non-dimensional measurement for its wall thickness (Schedule). For example, a 2″ (2.375-inch) diameter pipe that has Schedule 40 has a wall thickness of 0.154″. Whereas, a 1″ diameter Schedule 40 pipe actual wall thickness is 0.133″. OD’s (Outside Diameter) of pipe remains the same regardless of its Schedule. MATERIAL: Often made from carbon steel and/or low alloy steel. JOINING/WELDING: Joining steel pipe is very labor intensive. Welding, pressure joining, flanges, and threading are the main methods of joining stel pipe. MECHANICAL/CHEMICAL PROPERTIES: The chemical elements of steel pipe, i.e. Carbon, Manganese, Silicon, Sulfur, and Phosphorus are its main components., However, unlike a steel tube, few microelements in steel pipe are required. Instead, a steel pipe’s pressure rating, ductibility, and yield strength are most important. Due to application requirements, pressure properties and other specifications for pipe are strictly indicated. However, the tolerances for pipe is looser than tube. The later is tolerance specific referring to diameter, wall thickness, roundness, and straightness. As stated previously, tube and pipe have unique use requirements. 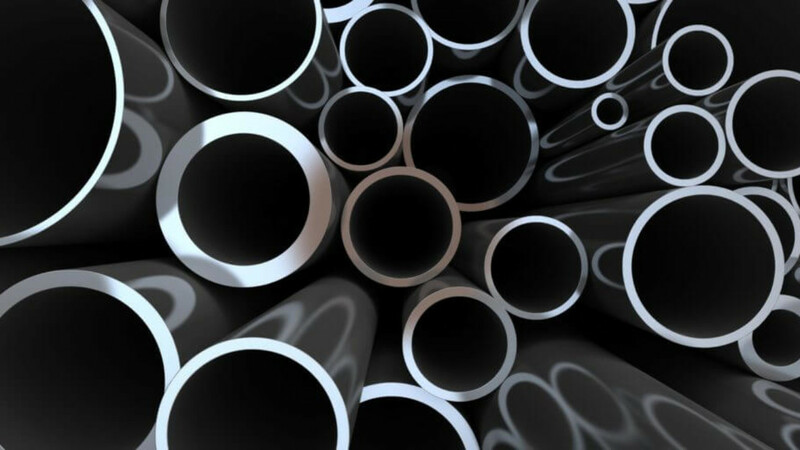 Steel tubing is used in more precision applications than pipe. Therefore, pipe manufacture costs less to manufacture due to fewer precision requirements. While tubing requires more use capabilities and narrower tolerances, raising its manufacture costs. Tubing is well-suited for applications such as medical, weaponry, machinery parts, boiler tubes, and exchanger which require precise outside diameters and other measurement requirements. While steel pipe is used to carry large amounts of gas and fluids, their OD (Outside Diameter) and ID (Inside Diameter) determine the flow rate and pressure capabilities. However, tolerances for pipe is typically less demanding. As shown above, there many differences between Steel Tube and Steel Pipe. However, their origins are the same. Therefore, they are ancestors in a way. Both were borne of the need to transport essential elements such as water, waste, and fuel. In short, they provide a means to convey liquids, gas, and solids. Though they do so in very different ways in varying methods based on the application.